Anne Gelhaus reports for the San Jose Mercury News, Aug. 19, 2015, that the Marienthal family adopted Bubba the cat in 2009 and tried to make him an indoor cat. But Bubba likes to roam and has become a fixture in two nearby schools — Leland High School and Bret Harte Middle School in San Jose, California. Amber Marienthal said “He’s really loud” and that she still gets calls from staff and students who see him on campus and think he’s lost. 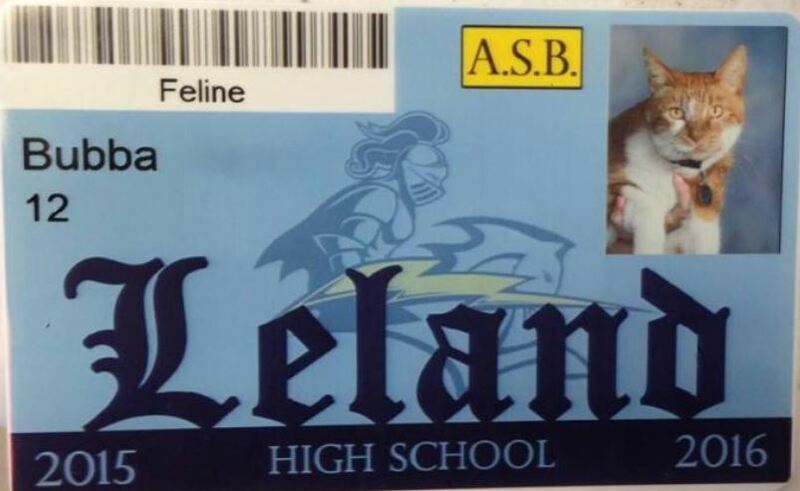 Like many members of Leland High School’s student body, Bubba is a social animal — he attends sporting events, hangs out on campus with his buddies and has a Facebook page dedicated to his exploits. 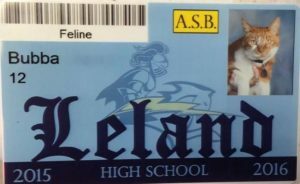 Bubba even has a Leland student card. But unlike Leland’s other students, Bubba can roam the school’s halls freely during class. 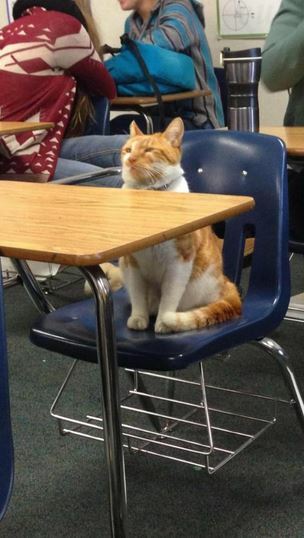 And if he wants to be excused, he doesn’t have to raise his paw; he just meows. Bubba has been featured in other media. He’s been written up in the high school’s newspaper, senior magazine and yearbook. Marienthal says “The students at Bret Harte petitioned to have a statue erected in his honor,” but their petition was denied. Both of Marienthal’s sons attended Bret Harte and are now at Leland. She says Bubba started hanging out on campus about a year before her oldest son Matthew, who just started his sophomore year at Leland, entered sixth grade at the middle school. And she says the cat is likely to stay in school even after both of “his boys” graduate. While he usually makes it home at night, Bubba did have a scare when he wandered onto the Leland campus during registration last month and accidentally got locked inside a classroom for 36 hours. Luckily, a security guard heard him meowing and set him free. Bubba’s Facebook page is at facebook.com/bubbatheschoolcat. This entry was posted in Uncategorized and tagged Bret Harte Middle School, Bubba the cat, Leland High School. Bret Harte Middle School. Bookmark the permalink. Bubba, what a smart kitty, lovable and very smart! I watch the next door cat and his antics make me laugh, he plays sweet so that I pet him, that is only when he wants, otherwise he ignores me, I still love Mister. And who said they are dumb animals never meet this cat. Hope he gets his diploma a great story Doc. Obviously, Bubba is not an ordinary cat. He loves the social scene and being around activities with lots of people. Let’s hope he’ll stay safe as he gets older.